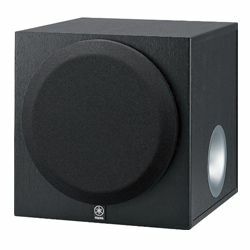 The SVS PB16-Ultra is a perfect subwoofer for people who want to shake the whole building with the punchy bass sound. This is a model that can cover a very huge area with the deep bass sound. This model is built and engineered using the latest technologies, which helped to achieve the clear output sound. This is model is not only a very powerful solution, but it also looks very modern. It is a very reliable modern. 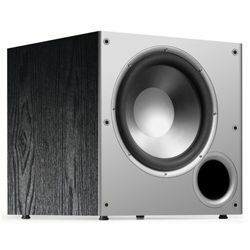 This SVS PB16-Ultra review would be extremely helpful for people who want to get a super powerful, modern subwoofer. 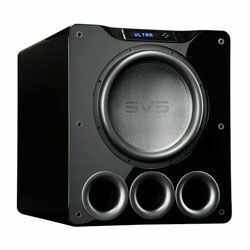 The SVS PB16-Ultra design tells that this is a serious subwoofer – it has a 16-inch driver located on the front panel. The enclosure is vented. The three ports are located on the front panel as well and you can see them right under the driver. The woofer is made from fiberglass, which makes it very firm and strong, so you get clear sound without any resonance or “muddiness”. It also features an 8-inch high power edge wound voice coil. The body is made of MDF and it makes the whole construction durable and strong. The front baffle is double thick MDF, while the optimized design of cabinet bracing makes it stable and completely resonance-free. The smooth edges and a nice finishing make this model look very modern. This model features a display with several buttons, which makes it easier to tweak various parameters. The display is embedded in a front chamfer, so you can easily reach the buttons and use the display. The back panel has all the ports you need. This model features RCA LFE inputs and outputs, XLR inputs and outputs. The dimensions of this model are 21.7x25x30.9, while the weight of the model is 174.6 pounds. The SVS PB16-Ultra specs show that this is a truly amazing subwoofer which can satisfy everyone. The nominal output power is 1500 W, while the maximal output power is 5000 W. the audio amplifier output power is 4000 W. This high output power makes it perfect for huge areas. The frequency response is from 16 Hz to 460 Hz, while the crossover frequency is from 30 Hz to 200 Hz. therefore, this model not only handles a wide range of frequency perfectly, but you can also blend it with other speakers you have. Moreover, this model features advanced digital signal processing technology that makes the audio blending process easier. This model comes with an application compatible with Android and Apple devices. The application allows you controlling polarity, phase alignment, parametric equalizer, room gain, and other DSP functions. You can also save and load presets. The reliable Bluetooth module installed in this model allows you accessing this subwoofer even from a big distance. Customers are satisfied with the output sound – it outputs clean, powerful, room-filling bass. It is very powerful and there are not many people who would like to push this subwoofer to the limit. The output sound is not distorted, even if the volume level is set high. It is a great option for music, movies, and gaming. Some customers also recommend putting this model on its own circuit. 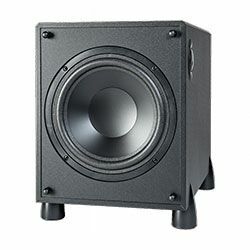 Many customers claim that the application that is used to control this subwoofer is user-friendly and it is easy to navigate through. The application has detailed sound optimizing settings and you can also reset the SVS PB16-Ultra settings. 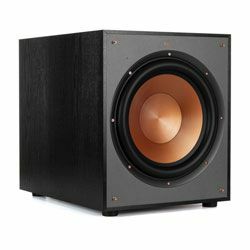 However, customers claim that this model is very huge and heavy – therefore, you need some space for this subwoofer and you may have troubles “delivering” this subwoofer to its place. Customers do not have any issues with the PB16-Ultra setup process. The only difficulty is its size – you need to find an appropriate place for it, plus it is quite heavy. The ports are labeled and you should not have any issues with connecting everything. The application is also easy to use, so you can adjust various settings and make it sound as you want. If you need a super powerful solution, then SVS PB16-Ultra is exactly what you need – it is able to shake the whole building with its power. However, it is not only a good looking subwoofer, but it also sounds amazing – the output sound is crisp and clear. It is built well so it does not vibrate and the ports assure a perfect noiseless connection. It is quite big and heavy, but that is necessary to get this amount of power. This model costs around $2500, but many customers do not regret the money they have spent.